1 month to go - HELP! Emergency! Is it possible to get 720 in a month? So i've been following this platform for a few days now and am overwhelmed to see how supportive this community is. I thought, why not post my problem, maybe someone would help me out. I need a 1 month plan for myself. Please HELP! So, I'm yet to appear for my GMAT. I'll be appearing on 4th Sep'17, which slightly more than a month away from now. My first Diagnostic test result - 450. Now I have to mention, that I am not used to sitting for 3.5 hours at a stretch. I took the test from Magoosh so that I could figure out where I was making mistakes later. Soon into the test, my patience was wearing off. I was not bogged down by the score but I indeed am worried. I need a 720 on the test. Currently I'm using Magoosh, doing my quant from Manhattan prep books (my quant is weak , solving the OG, and also going for class for a month so that in the structured pattern that people in coaching classes teach, I can ensure that I'm not missing out on any important concepts. I'm trying to maintain an error log. For Verbal, I know that I'm not giving it enough time since most of the time I'm worried about how I am doing on quant. But even with this, my quant score is not exceeding 60%. I need to bring it up to 90%. I'm still not done with Integrated reasoning or AWA. Data sufficiency is something I struggle with - especially when it comes to inequalities and sometimes coordinate geometry. 1. What level is Magoosh at? It seems pretty good to me, the difficulty level. Will the GMAT be tougher than that? 2. Is the OG too easy? Should I expect questions of that level? 3. How do I cope with timing? I'm still trying to get my answers right, but there isn't much time left. 4. I thought I should keep giving mocks to endure the real test. Which mocks would be best? Is giving sectional mocks just as good? 5. I need a 1 month plan. To ace this. I have full days with me, I'm focused on doing this and nothing else. If need be, I will appear for the GMAT again in a span of 16 days, but I need to give my best. Please help me out people? Love. I would suggest you stick to basics. Try to learn all the concepts testing in Quant and Verbal. Do only OG for Quant till you improve the Quant score to Q45+. Then you can use GMATclub tests. For Verbal- While learning the concepts do Magoosh, egmat or veritas prep till you understand the concepts. Once you learned all the concepts, practice them on the OG. And stick to OG for Verbal. Also you can use the question pack from GMAC if you want more practice. So can you tell us about your mock test scores? Q & V split ups? I had the same issues when I was preparing for my first attempt. I took 4 weeks off from work and tried to cram everything within that period hoping to break the 700 mark. Since I was on a time crunch, I did not go through the basics properly, did not have sufficient practice on each problem type and ultimately I was very weak on the timing strategy. I was never able to finish the test without guessing multiple questions in each section. Before the D-day, I was not feeling so confident and ended up scoring 590 on the real GMAT. I spent 8+ hours a day for 4 weeks studying for GMAT and I scored 80 points more than my initial diagnostic test (510). All I am trying to say is that you have to start loving the GMAT. Go through each concept tested in GMAT, understand each problem type, practice more and more until you have a structured approach for yourself to attack each question type and you will definitely ace the timing issue. Since you are just 4 weeks away, I would suggest that you get a strong foundation on concepts and practice only from Official sources - OG, QR, VR. Try giving the free and paid GMATPrep tests each week. Most importantly, jot down a structured approach for each question type and practice it diligently. 3) How have you scored on each of your CATs (including the Quant and Verbal Scaled Scores)? When did you take your initial Diagnostic CAT? I do understand it seems like an unrealistic goal, but I still don't know where I stand. The reason being, when I'm solving from the OG, I get 80% of my questions right. But on Magoosh, it sways from 50-75%. And the diagnostic test I took on Magoosh was not in the right mindframe. Also, I am aware of the areas that I know very little about, concept wise. In quant at least, I know more or less where I am stumbling. Having said that, I know there are a lot of minor details that I need to focus on to be able to increase my speed. I need you to know that it was because of my speed that I lost on 12 questions in the diagnostic test. I didn't get to answer them. I have been studying for 2 months, but I've only started focused studies since last month. A week ago, I bought Manhattan Prep books ( 5 books for quant) since I read that it's very useful. I didn't take an initial diagnostic CAT since I was sure I didn't know anything. The only diagnostic test I took was on Magoosh, about 2 weeks ago. The reason I'm planning to give my exam in a month is because I need to apply to a school in India whose application deadlines close by Mid-October. In case I need to reappear for the GMAT, I can take it by 22nd-25th September. Apart from that, I will be applying to schools based on my score. I have shortlisted MIM schools, since MBA schools require at least 5 years of work ex, and I have 1.5. Although I agree that it IS unrealistic to hope for your score to jump from 450 on the very first test ever to 720 on your final, I don't think it is not achievable for me. I am willing to put in all the time and effort into identifying my weaknesses and working on them, provided I understand where I am faltering. Hence, I'm maintaining an error log now. I know my strengths, and am still figuring out weaknesses. But I'm hell bent on doing this. I am now planning to take another test either today or tomorrow, so that I can figure out again, where I stand. BUT, I need to know which test would most accurately help me understand that. I need something that's closest to the real GMAT. The OG questions are easier than Magoosh, so I figure Magoosh wouldn't be the right measure. 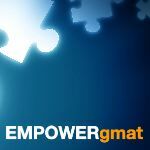 Should I go for GMAT Prep? What else should I go for? I plan to give 2 mocks every week henceforth. To start, if you're looking to take one of the most realistic practice CATs available, then you should take on of the Official GMAC CATs - you can download 2 for free from www.mba.com. It's important to take that CAT in a realistic fashion (take the FULL CAT - with the Essay and IR sections, take it away from your home, at the same time of day as when you'll take the Official GMAT, etc.). Once you have that score, you should report back here. Beyond those details, it's important to remember that taking lots of CATs will NOT make you a better Test Taker. A CAT is really a 'measuring device' - when used correctly, it will give you a realistic score and help define your strengths and weaknesses, but it will NOT help you to fix any of those weaknesses. To raise your scores, you have to put in the necessary practice and repetitions. The CAT will show you whether your studies are helping you to improve or not. As such, you really should not take any more than 1 FULL CAT per week.